Artistic expression is amazingly therapeutic way to work through past trauma. Readers of my first book ‘Under The Influence - Reclaiming My Childhood,’ will know that I have faced a degree of trauma during my childhood and early adolescence. My father was an addict, paranoid schizophrenic, chronic hoarder and drug dealer. While he never harmed me directly, the clientele that he allowed into his house were a different story. I am still not entirely certain of exactly what happened, but I know that I have many partial memories of sexual abuse, emotional neglect, and exposure to a dangerous world that was well beyond my years. While life at my mother’s house was far safer, I didn’t feel that I had the emotional support needed to help deal with both the normal adolescent changes as well as the above mentioned mental afflictions. Eventually, at age 15, I moved out of home to live with my then girlfriend who was also facing issues with her home life. Looking back over my past, it feels like I was in survival mode for a lot of the time, first through life at my father’s house and then handling life away from home. I have felt hamstrung by my past. Tied to my trauma and limited by neglect, I struggled to move on and start living life on my own terms. I have tried many different psychological interventions, including medications, but they were ineffective as a long term solution. These treatments kept me from suicide, but didn’t really bring me any lasting relief. It wasn’t until I tried writing that I saw major improvements as a direct result of treatment. Unlike talking therapy, I found that I could express myself far more freely onto a blank page. When I sat down to write, I didn’t have to worry about what the page thought of me. It can’t judge. I could ramble, reiterate and back track without concern for transmitting understanding to someone else. Writing became a form of pure expression that I had never experienced before, providing an emotional release like no other. I started with simple free writing. This involved just writing down whatever came to mind onto the page. No time limits, no narrative, no thought for grammar or story. I just wrote my thoughts. I don’t keep much of this stuff, usually I burnt, flushed or threw out most of this kind of writing, often without even reading over it. The healing comes from the writing itself. From there I moved onto writing poetry. If you had have told the teenager version of myself that I would not only be writing but also recommending the writing of poetry to other people, I would have laughed. School corrupted me into believing that poetry is something best left to those with an innate artistic streak or those born 100’s of years ago in a forgotten, distant empire. This is simply not the case. Poetry is great because it combines self-expression with the skillful choice of word and rhythm. Don’t get me wrong, I am by no means a great poet, but the act of creating poetry from the heart has been tremendously beneficial in the healing process. To the dark wishes that I'm fighting to suppress. To the unwavering ache and torment that’s causing me to regress. I must profess, I desire to express my stress, confess to address this abscess. To obsess on happiness, to aim for excess and to stop living like a fucked-up mess. Yes, I want to make progress but there are just some things that I can't quite express. Following poetry, I got into writing about the specific events that occurred in my past as a way to get a deeper understanding. Not only what happened to me when I was younger, but also as a way to begin the process of moving on from it. Through this process I was able to look at the more traumatic events from my past in a safe and detached manner, allowing me to get a more adult understanding of the events that occurred, and through the continued help of my psychologist, I am slowly working through it. This process was not without its own problems, as through the process of writing, new and more troubling memories have come to the surface, the contents of which I now have no real way of verifying. However on the whole, the process is tremendously therapeutic. The more I write, the less my past impacts me. Eventually I showed these writings to some friends of mine who convinced me to share it with the world as a way to help other people dealing with similar circumstances in their life. Ultimately this became ‘Under The Influence - Reclaiming My Childhood’. I continue to write daily, although now in addition to poetry or personal narratives, I am now moving into writing fiction. Self-expression through art is one of the best forms of emotional release. Although I would strongly recommend everyone attempt writing therapy in the form that I describe in the TAKE ACTION below, creative expression is where the real benefits lie. I am not much of a drawer, sculptor, musician, singer, photographer or dancer, however I have spoken to many people who have found similar benefits to what I have from writing from their chosen art form. I have also found similar benefits from the ‘art’ component of martial arts, only to a much smaller degree than writing. Try writing, and if that doesn’t click with you, try some other form of artistic expression. This may mean taking classes or looking at online instructional to develop some of the basics needed, but it will be well worth it. When you find a form of expression that you connect with, express yourself each day. Take some time to let go of the accumulated daily stress and reoccurring memories from your past. You don’t need to share your creation with anyone unless you want to. This is purely for yourself. Spend the next five minutes free writing. Write down whatever thoughts come to mind. Don’t think about what you are writing, don’t edit the words, grammar or spelling, and don’t think of the final product. Just write. It is the process of writing that is important here, not the product that you end up writing. You don’t even have to look over what you have written to get the benefits. Initially this may be a difficult process as you could potentially feel self-conscious. This is to be expected and will pass with time and practice. Just keep writing. If you have to, you can start by writing that you feel awkward about doing the exercise. Given enough time, it will start to flow. The time limit of five minutes is by no means a maximum time. If you find yourself wanting to keep going, please do so. Write until it is all out of your system. I have also found benefits from writing a daily journal. Unlike the free writing exercise described above, journaling is a more structured affair. I found that noting down what happened each day and how I felt about it allowed me to detach from the day’s events and to see them from a clearer perspective. I have added to this process by also tracking my mood through a subjective number based ranking system. For example noting down out of 10 (10 being high, 0 being low), my levels of happiness, anxiety and energy. This process gave me enough valuable data to prove to myself that I am ‘not always depressed’. As you may well know, when you are suffering from a mental affliction it can be easy to believe that you have always felt that way. A simple check over the journal revealed to me the fact that my moods don’t stay the same. I could observe that in my past, times of ongoing depression always relented into times of no depression and then into times of ongoing happiness. What’s more, it enabled me to look back and see if there are any trends, people or events that directly lead to bouts of depression. This information enables me to better ‘Guard My Mental State’ (chapter 2.1). Take five minutes to note down the events of your day as well as how you are feeling out of 10 (10 being high, 0 being low), in terms of happiness, anxiety and energy levels, as well as anything else that you would like to keep track of. What is your favorite form of self-expression and why? Tweet @zacpphillips #expression, with your thoughts. A) Developing positive habits like daily expression will help your mental state to trend upwards. Alternatively, you could use it as a tool for when you are suffering from a particularly strong mental affliction. Q) Should I hand write or type my writing? Does it matter? A) I prefer hand written because it is quite portable and very easy to begin. There is no worry about batteries, saving documents or technical difficulties. That being said, writing is about expression. Write, type, or even dictate your voice, it really doesn’t matter, provided you are expressing yourself! Q) I am struggling to express myself honestly, I find myself holding back. A) Give it time. At first it may feel forced and unnatural. For me, I felt quite self-conscious in the beginning, but once I got going these blocks steadily broke down. Over time you will be more and more able to express yourself and will be significantly less judgmental. Keep going! Find a way to express yourself freely and then do it every day. This process will release the stress accumulated throughout the day as well as help you to move on from past traumas. 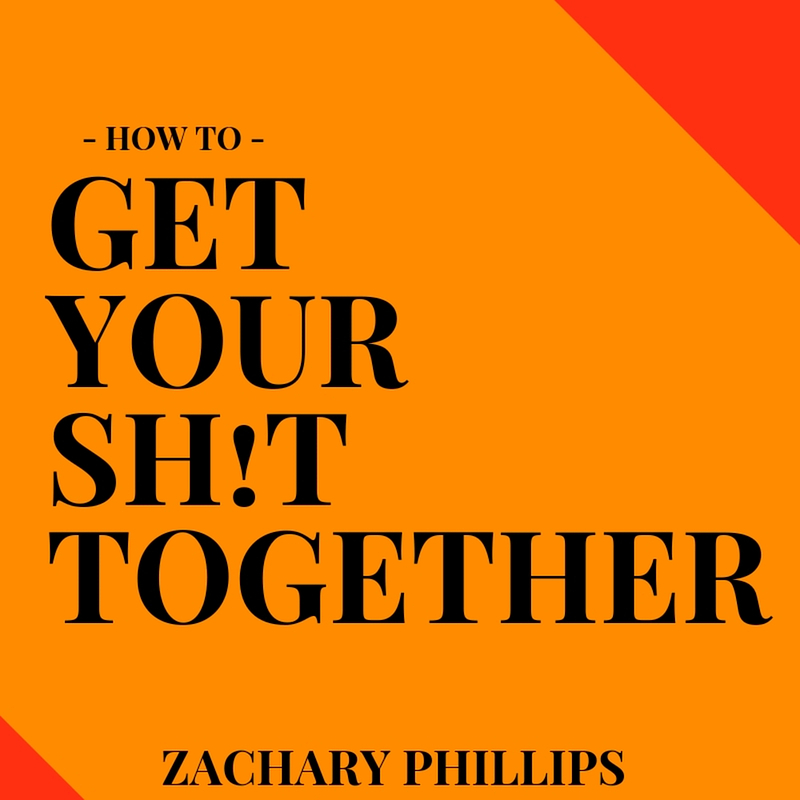 'Express Yourself Daily', is chapter 3.1 of 'How To Get Your Sh!t Together' - Out Now eBook, Paperback & Audible - Sign up to my email list to get every chapter sent directly to your inbox the moment they are released.